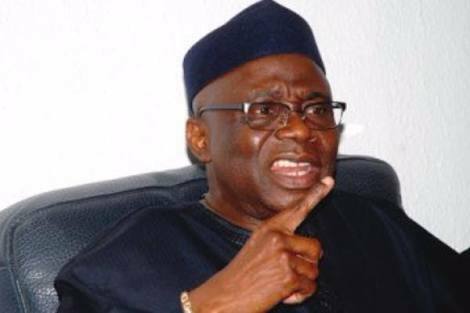 The General Overseer of Latter Rain Assembly Pastor Tunde Bakare has called on politicians all over the country to eschew peace in the forth coming 2019 elections, saying that peace is essential in the country for the transition process to be free and fair. Pastor Tunde Bakare who was the guest speaker at the Apostolic Fire Conference 2019, held at the Worship Centre Avenue, Oregun, Lagos, said that Nigerians should put God first in everything they do, "we should fear God not just because of the punishment that will come out of not fearing Him, but more importantly because we should fear Him so that fearing him will lead us to do things that will please Him." Pastor Bakare added that holiness enables us to know what God wants, and also enables us to do same. "The beauty of holiness is that we cannot do it by ourselves. There is the need to seek God and His standards which will determine our ability to to be holy according to the standard of God. Bishopric does not conjure holiness because it is just a title. But it is a habit of being in one mind with God, agreeing with God's judgement as written in the scriptures, measuring by the standard of God that determines holiness." Bakare concluded that holiness is not the exclusive of only Christians but holiness is open to everyone and to all politicians as well. Also speaking during the conference, the Convener and Host of the Apostolic Fire Conference, Pastor Seyi Adeyemi said that the issue of holiness is important for every individual and that is the reason that it has been brought to the front burner of this year's Apostolic Fire Conference. According to him, "holiness is needed to revive and beautify the life of the nation. Nothing can attract the nation to God and God to the nation other than holiness." Adeyemi also used the opportunity to call on the Federal government to urgently address the issue of ASUU strike which has kept university students at home these past months. "The government should meet with ASUU and resolve the lingering strike to avoid our children who are nowhelplessly sitting at home not to be throne into crime. Let us avoid youth restlessness." The Guest speaker and Presiding Overseer of the Latter Rain Assembly, Pastor Tunde Bakare attended the Apostolic Fire Conference in company of his wife Mrs Olaide Bakare. The theme for the Apostolic Fire Conference 2019 was "Beauty of Holiness."